This anonymous WW2 period card has previously featured in WASG, but it was a long time ago and it is a good link with the Howard Leigh piece. 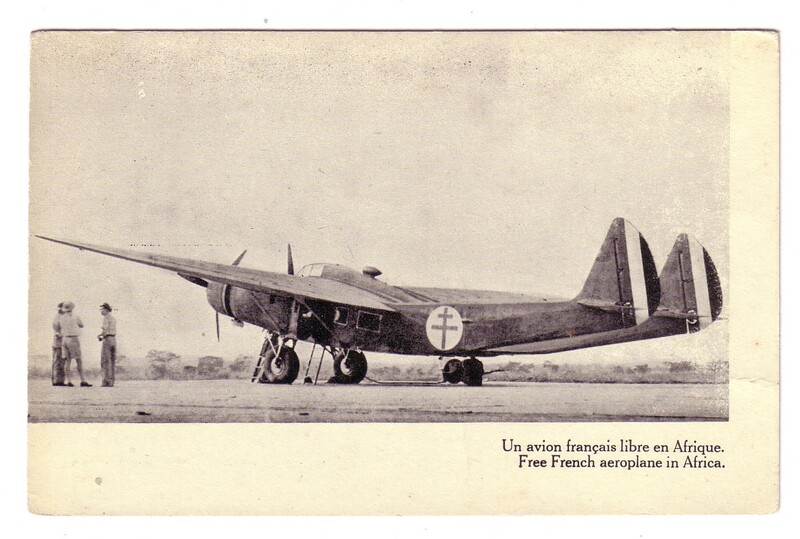 The aircraft shown here in Free French markings in, then, French Africa is a Cunliffe Owen OA.1 Flying Wing. It was a 15 seat airliner powered by 2 Bristol Perseus radials and constructed by the Cunliffe Owen company at Southampton Eastleigh in 1938 – the factory survives as a Ford Transit Van plant. Cunliffe Owen was formed specifically to build the OA.1 and was financed by the then chairman of the British American Tobacco Co, Sir Hugh Cunliffe Owen. The OA.1 was a development of the U.S Burnelli UB.14, designed by Vincent j Burnelli. This had demonstrated its capacity by being used as a flying showroom for Essex cars. Originally it was to be built under the name Clyde Clipper by Scottish Aircraft Ltd located, oddly, in Willesden, London. The Dutch Aviolanda company was also interested. It was originally proposed to fly the UB.14 transatlantic but this was abandoned and it was shipped by sea and was impounded by customs at Southampton. Meanwhile Scottish Aircraft had gone into liquidation. Whatever the potential of the design, it was the wrong time to be developing a civil airliner in the UK. On the outbreak of WW2 it was impressed into the RAF, but, as a one-off with no obvious use, was generously donated to the French in 1941. Anecdote has it that Jim Mollison agreed to ferry it to West Africa while drunk – the agreement that it is, not the flight, but who knows. While in Africa it is believed to have been used by General De Gaulle and was known to have survived there until late 1943.